Despite the small size of the country, the geology of Scotland is richly varied and boasts dramatic mountains, beautiful beaches, large lakes and areas of wild natural beauty. The Highlands of Scotland can be found in the north and they constitute one of the wildest and most stunning parts of the whole country. A large number of tiny islands can also be found in the Highlands of Scotland, which can easily be reached from the mainland by boat. The Highlands region of Scotland can be found to the west and north of the Highland Boundary Fault that runs all the way from Stonehaven to Arran. A large part of this region of Scotland is comprised by ancient rocks that date back to the Precambrian and Cambrian eras. These rocks were uplifted during the Caledonian era in order to form a mountain chain. The mighty rock formations are interspersed with a large number of newer igneous intrusions. The fact that these rocks are so well preserved has led to them being widely researched and geologists have discovered that many of these rock formations are more than four million years old. As a result, a number of natural parks and other reserved areas have been created to help preserve and protect these magnificent rock formations. In addition to Knockan Crag, a large number of other significant natural features can be found in the Scottish Highlands. This includes Ben Nevis, which stands at an impressive 1,344 meters and is the highest mountain in the whole of the United Kingdom. 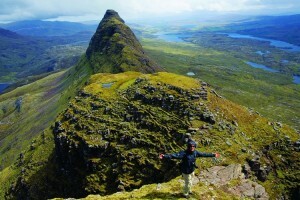 The Highlands are bisected by the Great Glen Fault, which is another dramatic natural attraction, while other impressive mountain massifs that can be found here include Skye Cuillins and the Cairngorms. This part of the country is also home to hundreds of tiny islands, many of which are uninhabited.